Medline.ru - Биомедицинский журнал INVESTIGATIONS ON A GRAVE WITH 13 UNKNOWN BODIES IN NORTHERN FINLAND. DEATHS CAUSED BY AN EPIDEMIC OR A FAMINE? ТОМ 4, СТ. X (сc. X) // Апрель, 2003 г. INVESTIGATIONS ON A GRAVE WITH 13 UNKNOWN BODIES IN NORTHERN FINLAND. DEATHS CAUSED BY AN EPIDEMIC OR A FAMINE? In the spring 1996, digging work was carried out on an old farm court in Northern Osthro-Bothnia in a village called Ruukki meaning "old iron foundry". The digging machine lifted out pieces of bones, which could be identified on the spot as parts of human skull, and the police was informed immediately. The area was isolated and the police, together with a forensic pathologist and an archeologist started investigations on the several skeletons found in the grave. The finding aroused great interest in the newspapers and a few rumours of the origin of the grave were circulating; for instance, it was claimed that a clandestine burial of victims of execution during the Finnish civil war 1918 had occurred. Due to the great public interest, it was decided that a more thorough investigation than usually should be undertaken. 1. To reveal the time circumstances and cause of this exceptional group burial. 2. To determine the number, the gender, height and the ages of the deceased. 3. To determine the cause and manner of death. The actual grave was an old tar-burning pit, which still contained charcoal pieces within the soil, which contained also sand. The soil layer was only half a meter thick above the skeletons. Some small pieces of wood were discovered among the bones (Fig. 1). Figure 1. Overview of the grave with skulls and bones. The skeletons and loose bones were lying in two layers. 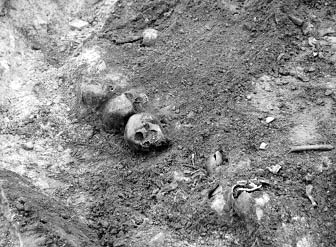 The grave and the bones were photographed while they were excavated by a forensic pathologist, aided by policemen and an archeologist. Quite soon, it became apparent that the grave was so old that the finding no longer concerned police and the investigation was continued for archeological and medical interests only. The bones were carefully excavated and cleaned, and the number of skeletons was preliminarily estimated. The bones were disintegrated and many were missing and the number of bodies was initially set at eleven to twelve. No clothing, belongings or remains of coffins were found in the grave, indicating that the bodies were buried naked. The bones were placed in cardboard boxes, which were numbered from 1 to 14 according to the place where they were lying. The bones in the boxes were assorted and arranged as skeletons, as completely as possible, on tables. There were only fragments of bones in boxes 2, 8 and 14, so that only a few measurements could be made on them. After this phase, it became evident that the finding included bones from 13 individuals of different ages. The gender was determined by using femurs, pelvic bones and skulls according to the known principles used in forensic osteology (1). The angle between the shaft and head and the standing angle was measured on the femur with a goniometer and the shape and width of the ball-like proximal head was estimated. The features registered on the pelvic bones were as follows: general appearance, the shape of the subpubic angle, the size and shape of the foramen obturatoria, the size and direction of the acetabulum, the angle of the incisura ischiadica, the posture and height of the iliac bone and the shape of the sacrum. The features registered on the skull were as follows: general appearance, supraorbital ridge, frontal and parietal protuberances, orbitas, forehead, chin bones, mastoid processes, occipital condyles, mandibula (size, shape, chin angle), zygomatic process, nasal openings and palatinum. All the long bones (humerus, radius, ulna, femur, tibia and fibula) were measured with an osteometer. If a part of the bone, usually either end, was missing, the original length of the bone was estimated by comparing the bone with a skeleton model. The measurements were compiled and the height of the body calculated according to the regression equations developed by Telkkä from Finnish material (2). The age of the deceased was estimated from the closure of the cranial sutures and from the dentition. To begin with, the age of the skeletons were estimated visually, and those were classified as children or adults on the basis of tooth development. The teeth still present were used for the age assessment. Some of the bodies were so destroyed, that the estimation of age was based on a very few teeth, in some cases even on one single tooth. (The age of the children were estimated by using the methods of Kataja et al. (1989) and Haavikko (1974), both of which are based on x-rays. For adults the methods of Johanson (1971) and Solheim (1993) were chosen). Both sectioned and unsectioned teeth were used according to the methodology. The final assessment of age was based on the information of all the methods used. Based on odontological findings there were 13 dead persons. The gender of 8 adults were 1 female, 5 males and 2 whose gender remained undetermined. There were 4 children aged from 4 to 6 years and one 12 year old. The age of the 5 males at death varied from 33 to 55 years. The female was 48 years. Those two deceased, whose gender remained undetermined based on odontological findings, were 39 and 46 years (Table). The examination of teeth included macroscopic evaluation. All the bodies had multiple hypoplasias in their teeth, which might indicate that the deceased had suffered from chronic and severe malnutrition. Children had hypoplasias also in their primary teeth, which had been formed during pregnancy. Table 1. The gender and age of the skeletons based on odontological findings. The skull and the bones of all skeletons were X-rayed in the nearby university hospital radiological department. The bones were sawed transversally along the shaft and 5-mm thick pieces were removed. The sawed surface was exposed to ultraviolet light lamp and the presence or lack of fluorescence was recorded. From the femur or brachial bone - which ever was better preserved - a 5-mm thick cross-section was sawed from every skeleton and fixed in 10 per cent formaline for 14 days. The samples were thereafter decalcified in 5 per cent formic acid for 19 or 26 days until softened. Thereafter, they were embedded in paraffin and the 6-µm thick sections were stained with haemotoxylin eosin. The tests were performed by dropping the solutions on the 5-mm bone pieces. The test is used in the Central Criminal Police laboratory for presence of blood in the sample. 1 g leucomalachite, in 100 ml of strong acetic acid and 150 ml of distilled water, was poured onto the bone followed by 10% hydrogen peroxide (H2O2). A deep green colour demonstrates the presence of blood. The solution was made by dissolving 0.2 g benzidin and a small crystal of sodium prusside in 15 ml methanol containing 4 drops of acetic acid. This solution was poured onto the bone, followed by a solution containing 50 ml 3 percent (H2O2), 100 ml methanol and 50 ml of ether. A deep blue colour appears when blood is present. 10% benzidin in concentrated acetic acid is poured onto the sample, followed by 20-30 percent hydrogen peroxide. A blue colour indicates blood in the sample. Number and gender: There were 13 skeletons altogether. Combined characteristics of the skulls and other bones and teeth indicated that the group included 5 males, 1 female adults and 5 definite children. The gender of two of the adult skeletons remained uncertain, but one was probably female (Table 1). The height of the males had been between 166.3 cm and 169.6 cm and that of females 159.2 cm and 161.9 cm. The children were between 93.7 cm and 161.8 cm tall, the tallest one probably having been a teenager. The age of the males at death was from 35 to 55 years. The two females were 40 and 50 years, and the three children 4, 5-6, and 12 years. The ages of two of the deceased whose gender remained undermined were 39 y and 46 y. More accurate identification was not possible (Table 1). The X-rays revealed no signs of trauma, or distinct diseases. The femoral and radial bones of some skeletons were slightly bent suggestive of rickettsia, which was earlier a quite frequent disease resulting from malnutrition. None of the bone cross-sections fluoresced, indicating that all of the bones had been in the ground for more than 100 years (Table 2). Table 2. The fluorescence, malachite green and benzidine tests made on the bone slices. The following observations were made on the bone sections: embrittling of the outer and inner surfaces and in the Haver's channels, and the visibility of the endothelium of the vessels. The degree of embrittling of the surfaces varied a little between the samples. The 100-year old reference bone was distinctly less embrittled, while the reference bones from the 1800th century were more embrittled. Endothelium was found in every sample (Table 3). The malachite-test and Pickworth's benzidine test gave similar results and were considered as reliable. These tests gave positive reactions on samples from only two skeletons. Uotila's benzidine test gave more positive results and was considered as too sensitive, or nonspecific. We concluded that the decomposition time had been over 100 years (Table 2). The use of an old tar-burning pit as a grave for the mass burial point to two circumstances present at the time of death. It is possible that the grave was aimed to be a temporary one, and the bodies were intended to be transferred to the local cemetery later on, when the emergency situation had passed by, or the seasonal conditions would be more appropriate. Another reasonable possibility is that the people had died of some contagious disease and that their burial had to carried out very quickly. Some support for the latter theory is gained from the fact that the deceased had been naked when buried and they were just placed in the tar-pit, without coffins, pointing to great hurry, or fear of death. There had apparently been no extra preparations for the burial; for instance, no ordinary deep grave had been prepared. The bones were largely disintegrated and their macroscopic appearance allowed the conclusion that they had been lying in the grave for more than one hundred years (1). For instance, the outer bone layer had lost the matrix and minerals to the depth of 1 mm, and the softer porous parts of some bones had disappeared. According to studies of the history of the geographical area where the grave was found, the mortality of the inhabitants was extremely high (3-fold higher than normal), during the decenniums 1830 and 1860 (3). During these periods winter was long, lasting until June, and the summer was exceptionally short, with first frosts coming as early as in August, causing a famine in Northern and Eastern Finland. In addition, bacterial epidemics, such as typhus and dysenteria, were spreading among the famished population. Groups of poor people left their homes and resorted to begging. These data can explain the mass grave in Ruukki, since it is quite possible that the deceased were originally from another part of the country. The cause of death can be concluded to be inanition and/or infectious disease since no signs of external force were observed in the bones. Supporting the possibility of infection, it is quite apparent that a burial would be carried out promtly to quench the epidemic and, in such cases, the clothes of the ill were burned to prevent the spreading of the infection. In summary, the grave had probably been a temporary one, or the burial had been carried out in a great hurry. The people had probably died of hunger and concomitant illnesses during famine years in the 1900th century. 1. Leopold D. Identifikation unbekannter Toter. Interdisziplinäre Methode, forensische Oeteologie. Schmidt-Römhild, Lübeck, 1998. 2. Oikeuslääketiede (Forensic Medicine) Unto Uotila (editor). W.Söderström, Porvoo, 1970. 3. Hiltunen M, forss A, Vilkuna J. Siikajokilaakson historia I. (The History of Siikajoki valley). Published by the communes and parishes of Siikajoki valley. Oulu, 1996.